Another win for Bayern who are coming back in top form just at the right time. A great game by Bayern tactically and technically as they destroy 1. FC Cologne at the beginning of the game. Perhaps the most spectacular and unorthodox tactical aspect in this game was the role of Rafinha. Under Guardiola Bayern often played with the so called “false full backs”. This basically just means that the full backs leave their position, go towards the half-spaces or the middle, overload these and act as additional central midfielders for a short time while no one else takes over their position. Normally they would do this in the second third and drop besides the pivot which would support him and open direct passing lanes for the center backs to the wingers. But in this game Rafinha had an even more interpretation of this role, especially at the beginning of the game. Rafinha would move from the position as right back between the two center backs and basically act like a sweeper. Normally this role belongs to the back dropping pivot who would create a back three in possession so the center backs can split, are harder to press and have another few positive consequences, like different passing lanes into midfield, different covering for the fullbacks, etc. Using the right fullback in such a role has obviously other motives. Rafinha would leave the right side so the oppositional winger couldn’t man mark him properly. The winger would mostly just stay on the wing and look a bit confused, while Bayern focused on the left side. With Rafinha in the middle as an option for passes and cover for Schweinsteiger the Bavarians could overload the left side better. 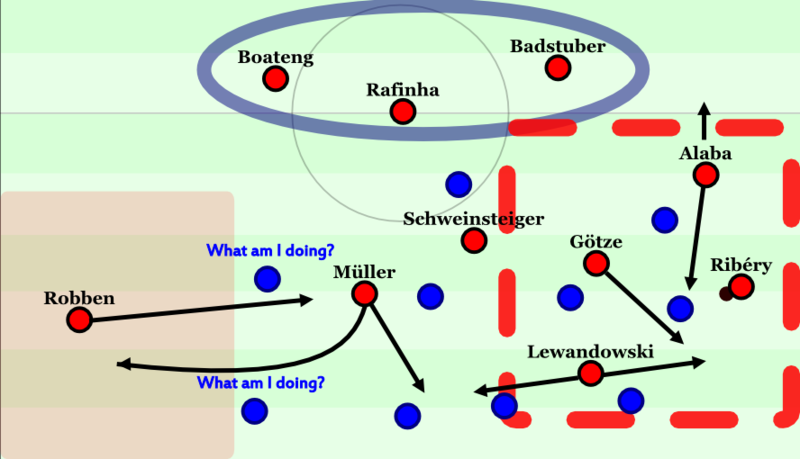 As Köln’s ball far players on their left side – the winger, the fullback and the left central midfield – were basically only covering irrelevant space Bayern could advance through the wing and half-space until the last third. Often it was no one or only Müller or Robben giving width on the right side while all the other players of Bayern were positioned in the middle or on the left. Of course they often had 2-3-4-1 shapes, too. 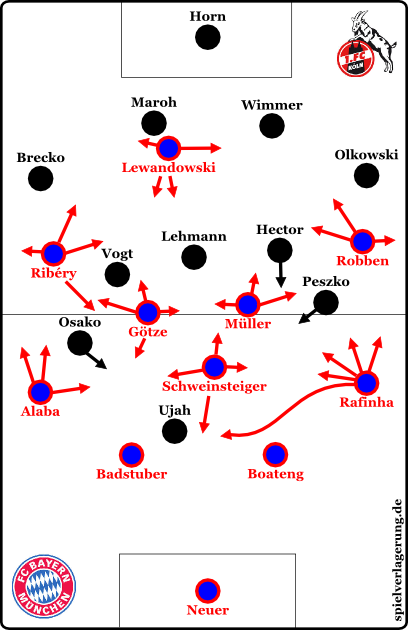 These formations were with Götze and Ribéry as a pair on the left, Alaba and Rafinha a bit indented into the half-spaces and Alaba mostly supporting Götze and Ribéry, while the pair on the right, Robben and Müller, would often vacate the right wing or only one would give width while the other would move towards the middle and overload there. Still the idea was quite similar to the actions with Rafinha: Use the left side, disorganize them on this side and force your way through the half-space or wing with fast combinations. The most effective situations where with Rafinha in his unusual role, Schweinsteiger higher and supporting and the movement on the sides which deserves its own explanation. Guardiola’s primary goal in every game is to create a movement and passing system for his players according to the oppositional system which creates advantages. And “creating advantages” can be used in this regards mostly synonymously with “opening space”. Bayern’s game today was a perfect showing of these principles. The basic initial formation of Bayern was probably something like a 4-1-4-1/4-3-3 with Götze and Müller as 8’s in front of Bastian Schweinsteiger. But this was visible only for a short time. Götze and Müller would often move from the middle to the sides, especially in the moments where Ribéry or Robben got the ball on the wing. Robben or Ribéry would drop or move a little bit deeper when getting the ball while the two central midfielders would move behind the oppositional players who would try to guard Ribéry or Robben. With this they would either block the oppositional player and he couldn’t guard Ribéry or Robben as he had to stay deeper or they would be open if he still ran after Ribéry or Robben. In the latter case the following combinations were easy to anticipate: Alaba on the left and Rafinha on the right (though to a much lesser extent) would create a triangle with the winger and the out-moving central midfielder. Also the wingers could dribble towards the middle and utilize the space Müller’s or Götze’s movement opened there. The wingers could then either combine with the ball far central midfielder or winger (which also means they could change the side fast and the other winger could get the ball in open space for dribbles) or cause havoc in the middle. It was interesting to note that this movement was again mostly on the left side. This is perfect for the players and their roles. Not only is Alaba very athletic and good in combinations in this role as supporting, offensive fullback, but Götze as left midfielder is a very good “connection-giver” (Verbindungsgeber in German), extremely intelligent in his movement and good in tight situations whereas Müller as right midfielder would often move up intelligently to support Lewandowski. When Ribéry dribbled into the middle, he’d often had Müller darting forward and giving another passing option while also opening the middle for Robben. Bayern with Rafinha in a holding role and their various movement schemes. Müller had basically two big options in his runs, Robben could get the ball wide for 1-vs-1s or move into the middle, Ribéry could get supported by three players when trying to move inside and they had something like a diamond there. Schweinsteiger gave connections in the middle. Here the asymmetrical 4-4-2 of Cologne is best to see. In some situations Müller would move first forward and then go to the right which created a midfield line with Robben and Ribéry in front of Schweinsteiger and Götze and Müller on the sides. The man oriented movement and marking of Cologne couldn’t cope with this movement and Guardiola probably specifically designed this movement to destroy Cologne’s organization. On paper Stöger’s idea was very interesting. The Austrian coach of Cologne used a 4-5-1 with flat midfield line where the right winger would often stand higher and position himself in the left half-space. In these situations the shape would look like a 4-4-2 where the two strikers were pushed towards the side. It’s not clear to me if it was accidentally used on Bayern’s focused side, if it was planned there in the beginning because of the Alaba/Bernat-pair from Bayern’s previous games or if it just was a consequence of Bayern’s focus on the left and the man marking of Cologne. As noted by @tempofreesoccer prior to HT; this doesn’t look good for Cologne. Although heatmaps are mostly meaningless in this case they visualize two things in a nice way: Firstly, Köln just didn’t do much. Secondly, Bayern was extremely focused on the left side while being quite narrow. As Guardiola once said: “In all team sports, the secret is to overload the one side of the pitch so that the opponent must tilt its own defense to cope”. Quite the tilt here, huh? In the end, this doesn’t really matter. Poor Osako tried to mark Ribéry, Alaba, Götze and Schweinsteiger in the same time as they’d always pop up in his zone but he would never be able to create access which meant no ball recoveries. Vogt and the fullbacks behind him were occupied by Bayern’s movement while the other players of Cologne didn’t have access to the ball. When Bayern changed sides in their attacking play Cologne not only had to move the whole width of the pitch but also had to cope with the brilliant movement of Müller and Robben’s individual quality which in turn was as hard to defend as the combinations on the left side. After half-time Cologne got a bit better and more dangerous. Their defensive scheme worked a bit better, Bayern was less intense and moving which in turn also made their combinations and their counterpressing a bit unstable. In the end it still was enough to win deservedly as Bayern took up the speed again and changed their system a bit with the introduction of Alonso instead of Müller. Bayern won unsurprisingly against Cologne and showed a good game with a brilliant first 25 minutes. Rafinha’s role, the very flexible movement of all the other midfielders, wingers and Alaba and the great combination play was the main reason for this win. Although Köln had a few good chances after counters, crosses and set pieces they were a bit underwhelming against a great side although they had some good chances after the break but in the end Bayern just proved to be too much. How should their reaction be like to handle that Situation in a right way? What frustrates me is that in England if a a manager tweaked his system like this fans and pundits would say that a manager is overcomplicating things especially if they don’t get the right result. It’s like they don’t realise that these adjustments and small details can make big differences. Is the view different in Germany? Depends on who you ask. There are some guys in Germany who argue similar, like Dietmar Hamann, Lothar Matthäus or Kicker’s chief Bayern reporter Karl-Heinz Wild. Though especially with the latter it’s mostly some kind of agenda against Guardiola. Yeah well I guess that there is always a few isn’t there, Hamann yeah he always talks rubbish on English tv. From what I read and observe the Bundesliga has undergone a tactical revolution, I think it is about time England followed suit. Anyway great writing man, keep it up. Yes, I agree. Bundesliga became more tactic focused lately. Also the fans adapted more to this so you can actually hear sometimes even tactical TV comments during a games that were unthinkable just five years ago. Still no match to this great site, of course, but the direction seems good. When crazy isn’t exactly an insult, you’re either Guardiola or rm. Ha! RM is just Pep’s internet avatar! Wow, quick and great as ever. What was your view on Timo Horn? Very good talent, should become international class one day, already quite good. What’s his GoalImpact? Highest Peak apart from Neuer. Big talent imho, too. Very interesting, I’ll keep an eye on him then.